A rare recording by a one-time vaudeville great, now all but forgotten  from 1905, Clarice Vance sings Mariar. Announcement "Mariar, sung by Miss Clarice Vance. Edison record." The story of Clarice Vance is a fascinating one. I first learned about Clarice Vance from Seattle record collector, Sterling Morris, who for some time has been researching the life of Miss Vance. Sterling inquired whether I had encountered either of the two wax cylinder recordings she was known to have made for Edison: I hadn't. As we corresponded, I learned more about her tragic life  this once bright and sparkling vaudeville actress and singer mysteriously dropped out of sight, lived her last years in a mental facility, died a lonesome death, and was barely remembered with a single-paragraph obituary. Thus, it was hard not to be thrilled when during a visit here at the tinfoil.com studio, veteran record collector Art Guenther pulled the following wax cylinder out of his box. As you listen to this recording of Mariar, you can learn more about Clarice Vance in the mini-biography, Clarice Vance  "The Southern Singer", contributed by Sterling Morris. No. 9051, "Mariar," by Miss Clarice Vance, introduces to the Phonograph public a new singer in the person of Miss Vance, who is one of the most widely known artistes in vaudeville. She is a top line feature in all vaudeville theatres, and is one of their most popular performers. Her work is always finished and never boisterous. While this Record is not as loud as many others, we feel sure that it will find many admirers. The Record shows Miss Vance in one of her big successes, and the song is given in her characteristic style. "Mariar" is a farmer's serenade. The music is by Mose Gumble and the words by Harry Williams. The Record is made with orchestra accompaniment. Click on these images or here to read a mini-biography on Clarice Vance. 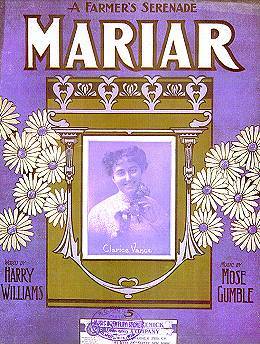 Sheet music cover page for Mariar, ca. 1905.